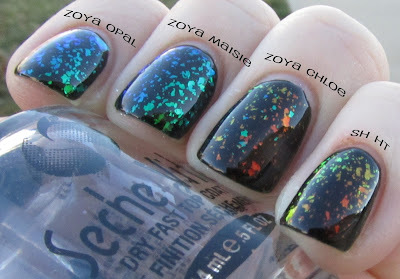 The next couple of posts I'm going to share are swatches of Zoya's two Spring 2012 collections, the Fleck Effects top coat collection and the True collection. First off I'm going to share the Fleck Effects collection, which as you can probably guess from the name consists of some gorgeous flakies! I will also show a comparison to Sally Hansen Hidden Treasure (SH HT), which itself is dupable to Essie Shine of the Times and Nubar 2010 (among others) so it is good for a comparison of those as well. All swatches are shown with one coat of the flakie top coat over the base color. Here we go! First up, all three polishes over black, along with Hidden Treasure. Immediately you can see here that Opal and Maisie are very similar in terms of the flakies - both are comprised of green-to-blue shifting flakes. Chloe is something totally different. It has both red-to-gold and green-to-blue flakies, making it unique as far as I am aware. Also, you can see here that none of these are a dupe to Hidden Treasure (and its many dupes). Yay! The above picture shows the shift in color of the flakies at an angle well. They are all totally gorgeous! Over white, you can see that the base of each polish has a subtle tint of color to it. This is one coat over white - more coats would of course give you a bolder base color. Hidden Treasure is in a clear base. 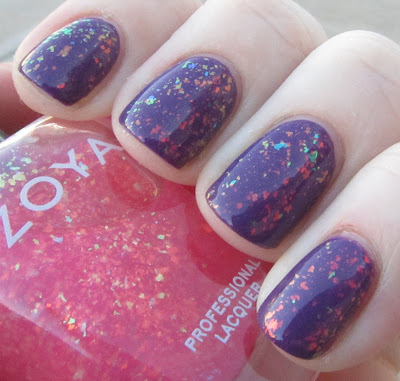 Finally, time to let these colors shine on their own over some corresponding colors from the Zoya True collection! There are some really amazing combinations possible here. Personally, I am fairly in love with Chloe over Tru. 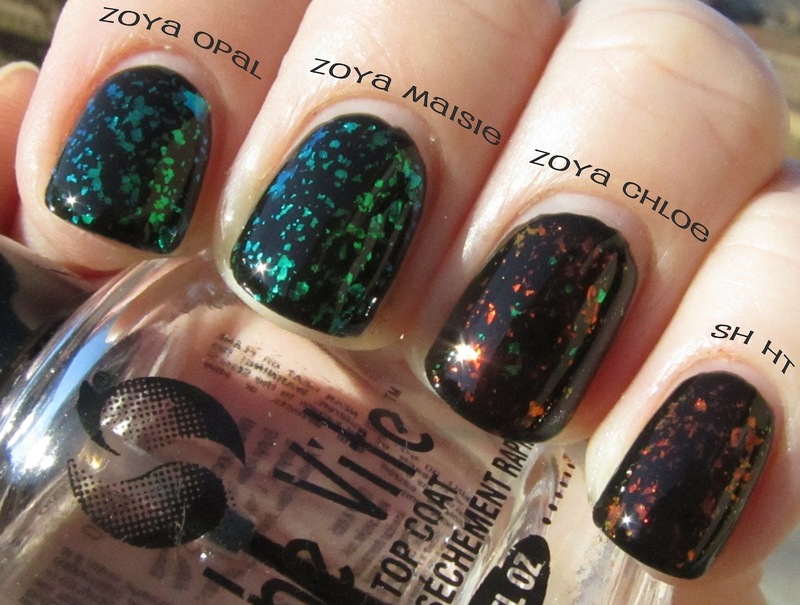 I really like that this collection didn't include a dupe of Hidden Treasure - there are already so many dupes out there! However, it was a little disappointing that Opal and Maisie were so similar. Perhaps a blue-to-purple flakie in Maisie would have been more unique? Since they are so similar honestly you probably only need one of those. Chloe is totally unique and gorgeous (especially over Tru!) so I would definitely recommend adding it to your collection if you are a flakie lover. The tinted bases will be fun to use over lighter colors as well. These all applied nicely for flakies, although like all flakie polishes you might find yourself having to place some of the bigger bits here and there with your brush. Flake topcoats are fun, and allow you to totally change up the look of a polish, so I would highly recommend having one or two in your polish stash if you don't already! :) Check back tomorrow for swatches and review of the Zoya True collection! I'm loving Opal and Maisie! I love Maisie! great post! Very neat. I've heard Barielle's Buddha-ful is also a flakie, but don't know how it compares. I dont really see a difference between Opal and maisie?? am I wrong?